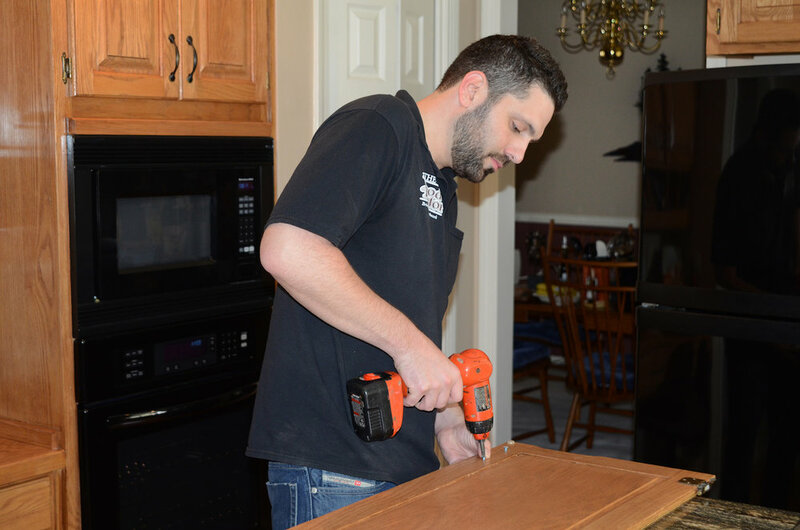 Cabinet restoration is the most economical, structurally significant and eco-friendly option when it comes to breathing new life into your cabinetry. Refinishing involves the use of a stripping agent to completely remove the old finish right down to bare wood. This allows new stains to be applied and is the process one would choose to change the color of the wood. We begin by removing cabinet doors and drawers, and then mask off the main work areas including an additional area we set up in a section of your garage. Then we strip the wood of the old finish, using an eco-friendly stripping agent, and thoroughly sand all the wood surfaces (this includes both the fronts and backs of cabinet doors, the drawers, and the ‘styles’ or ‘boxes’ to which the doors attach). The color stain is then designed, with your participation, so that we can be sure to match your ideal shade. After the stain is applied, we reassemble your kitchen/bathroom and apply multiple coats of long-lasting, heavy-duty UV-protected polyurethane finish. Now you have a completely transformed kitchen/bathroom with a brand new, upgraded look. This process really breathes life back into the wood and into the feel of the entire room. Lastly, we thoroughly clean up the kitchen/bathroom and garage—you’ll never know we were there! This is usually a 3- to 5-day process.